My dream vacation... Hawaii will always have my heart. It’s where I honeymooned and I simply love returning to this tropical paradise! Favorite quote... “Work hard, play hard” is my life motto! My favorite thing about working at Buzz Creators... Meeting new people everyday and learning the ins and outs of their business. I’ve always been a curious person. If I had $1 million dollars to spend... I’d pay off my mortgage and go on some exotic vacations overseas. I’m much more into “experiences” rather than “things” in general. My hobbies are... cooking, going to my kids’ sporting events, relaxing at a great spa, reading and vacationing! A natural-born communicator, Christina Rae found her career path early in life after a teacher of hers recommended that she either look into public relations or become a lawyer. Well, she definitely made the right decision! Nearly 20 years later, Christina is still passionate about her role as a PR professional. With nearly two decades of experience in marketing and communications, Christina is a seasoned and well-respected advisor to her clients. Her expertise includes public relations, reputation management, brand building, thought leadership and audience engagement. She has managed communications programs within a variety of industries including financial services, technology, security & risk management, law, healthcare, and beverage. No matter the industry, Christina has demonstrated the capacity to build and execute communications programs that support an organization’s business growth. She has built communications programs from the ground up for small start-up companies – as well as enhanced the efficiency and effectiveness of existing communications programs at large corporations. Prior to founding Buzz Creators, Christina was Vice President, Executive Communications at CIT Group, the world’s largest independent commercial finance company. During her two year tenure, she led the development of CIT’s executive communications program, including strategies and plans to drive exposure of CIT’s executive management team externally. She developed ‘thought leadership’ programs that supported CIT’s brand and reputation. Christina also created the CIT Speaker’s Bureau, which proactively placed CIT’s executives at leading conferences and forums. 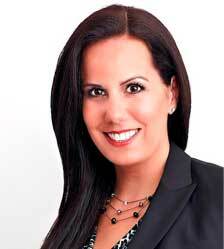 Prior to CIT, Christina served as Vice President, Global Communications, at MasterCard Worldwide. During her seven year tenure, she was responsible for developing and driving MasterCard’s communication strategy for its Advanced Payments, Security & Risk and New Markets & Investments divisions. Christina led the communications program for the very successful global rollout of the MasterCard® PayPass™ contactless payment program. Prior to her role at MasterCard, Christina served as a Senior Account Executive at Brodeur Worldwide, a leading public relations agency. During her three year tenure, Christina developed and managed communications programs for clients including Symbol Technologies, Philips Consumer Electronics, ENTEX Information Services and IBM. In addition, Christina has served in key communications roles at Prodigy Incorporated, Pepsi-Cola, and White Plains Hospital Center. Christina was named one of “Westchester County’s Most Accomplished Women Entrepreneurs” byWestchester Magazine’s 914INC in 2011. She was also selected by The Business Council of Westchester as a winner of “Rising Stars – Westchester’s Forty Under Forty” in 2010, and by Westchester Spotlightmagazine as one of “Westchester’s Rising Business Stars Under 30” in 2001. Christina recently served as Vice President on the Board of Directors for the Westchester/Fairfield Chapter of the Public Relations Society of America (PRSA), and also as its Publicity Committee Chair. She is also a member of the Professional Women of Westchester, The Business Council of Westchester, The Yorktown Chamber of Commerce and The Hudson Valley Gateway Chamber of Commerce. Christina received a Bachelor of Arts degree in Communications from Pace University. She is a strong believer in “paying it forward” and volunteers for numerous community organizations, including The Leukemia & Lymphoma Society (LLS), The Ty Louis Campbell Foundation, The Alliance for Safe Kids (ASK), her local PTA, and Pace University’s alumni mentor program. Christina lives by the mantra — work hard, play hard. Outside of work, her interests include reliving life through the eyes of her three beautiful children, traveling, photography and cooking.